Enjoy the 11:30 a.m. to 12:30 p.m. cooking demonstration by Le Bouchon’s legendary French Head Chef Jean Claude Poilevey and son, Sous Chef Oliver Poilevey. A recent inductee to The Culinary Academy of France, Chef Poilevey strives for authenticity in his delicate and romantic French bistro. 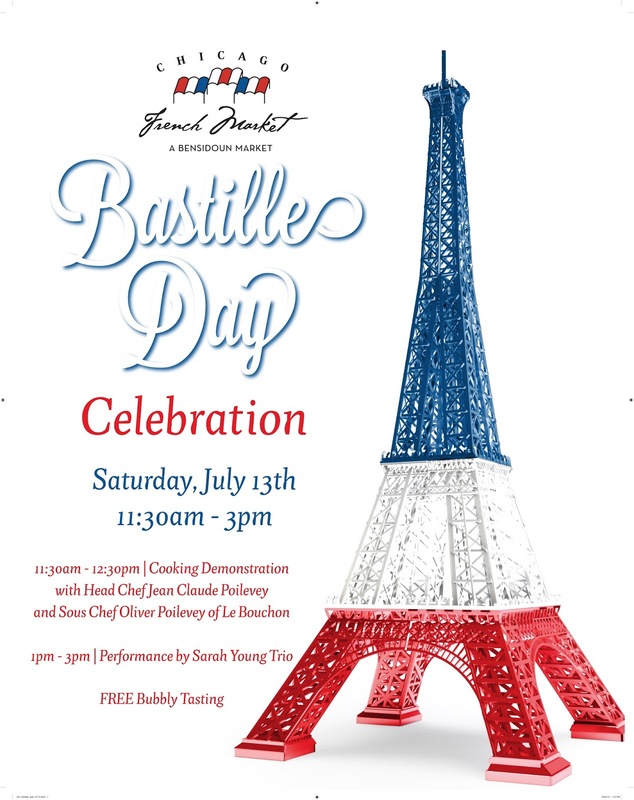 In honor of Bastille Day, Chef Jean Claude and Chef Oliver will demo classic French dishes. Sarah Young was a semifinalist in the Thelonious Monk vocal competition in 2010, and won first prize in the Shure Montreux Jazz Voice competition in 2011. Come experience her breath-taking voice with this diverse trio comprised of piano, upright bass and vocals. Enjoy the Free Bubbly Tasting as they perform Jazz, Latin, Swing and Dance Standards with French embellishments and feel. For those who don’t know, on July 14, 1789, the people of Paris raided the Bastille fortress-prison to demonstrate their independence and the uprising of the modern nation. This iconic moment in French history, marked the beginning of the French Revolution. Centuries later, Bastille Day has become a worldwide celebration, with parades and festivals held around the globe to honor French culture.